Idaho has placed in the top 5 as “Top Moving Destination,” as Americans continue to pack up and head West and South. Those are the results of United Van Lines' 39th Annual National Movers Study, which tracks customers' state-to-state migration patterns over the past year. 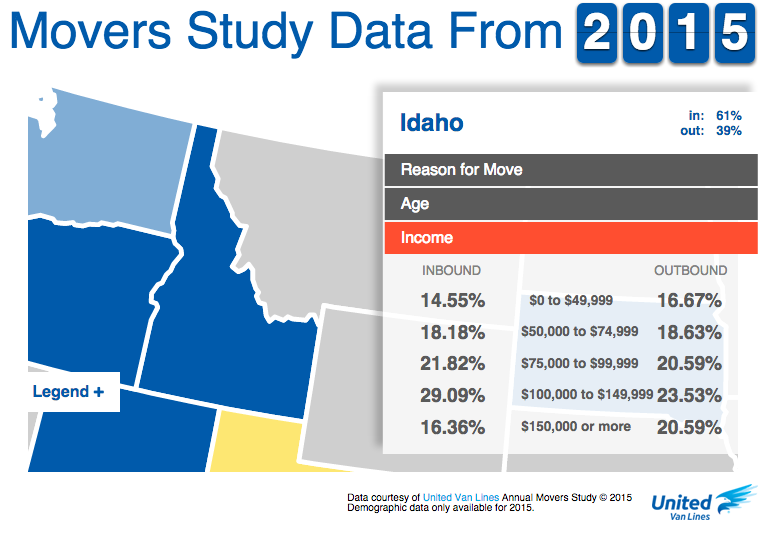 Oregon was the most popular moving destination of 2015, with 69 percent of moves to and from the state being inbound. The state has continued to climb the ranks, increasing inbound migration by 10 percent over the past six years. 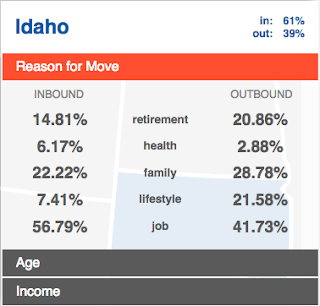 With 61 percent moves inbound, opposed to 39 percent outbound, Idaho ranked No. 4, behind Oregon, South Carolina and Vermont. The Southern states also saw a high number of people moving in with 53 percent of total moves being inbound. In a separate survey of its customers, United Van Lines found the top reasons for moving South included company transfer/new job, retirement and proximity to family. The Northeast continues to experience a moving deficit with New Jersey (67 percent outbound) and New York (65 percent) making the list of top outbound states for the fourth consecutive year. Two other states in the region — Connecticut (63 percent) andMassachusetts (57 percent) — also joined the top outbound list this year. The exception to this trend is Vermont (62 percent inbound), which moved up two spots on the list of top inbound states to No. 3. "For nearly 40 years, we've been tracking which states people are moving to and from, and we've also recently started surveying our customers to understand why they are making these moves across state lines," said Melissa Sullivan, director of marketing communications at United Van Lines. "Because of United Van Lines' position as the nation's largest household goods mover, our data is reflective of national migration trends." "This year's data reflects longer-term trends of people moving to the Pacific West, where cities such as Portland and Seattle are seeing the combination of a boom in the technology and creative marketing industry, as well as a growing 'want' for outdoor activity and green space," said Michael Stoll, economist, professor and chair of the Department of Public Policy at the University of California, Los Angeles. "The aging Boomer population is driving relocation from the Northeast and Midwest to the West and South, as more and more people retire to warmer regions." United has tracked migration patterns annually on a state-by-state basis since 1977. For 2015, the study is based on household moves handled by United within the 48 contiguous states and Washington, D.C. United classifies states as "high inbound" if 55 percent or more of the moves are going into a state, "high outbound" if 55 percent or more moves were coming out of a state or "balanced" if the difference between inbound and outbound is negligible. In the Atlas van lines survey Idaho was #2, again behind Oregon.